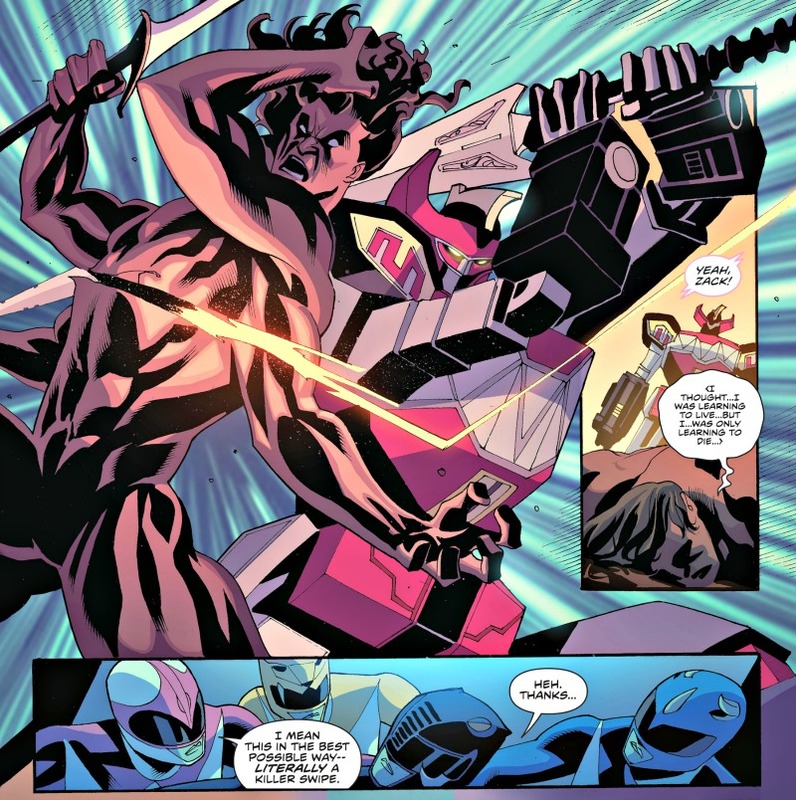 A Mighty Morphin Power Rangers #5 Review – Where Is Walter Jones? PENCILLERS: Thony Silas, Corin Howell. Cover by Jamal Campbell. 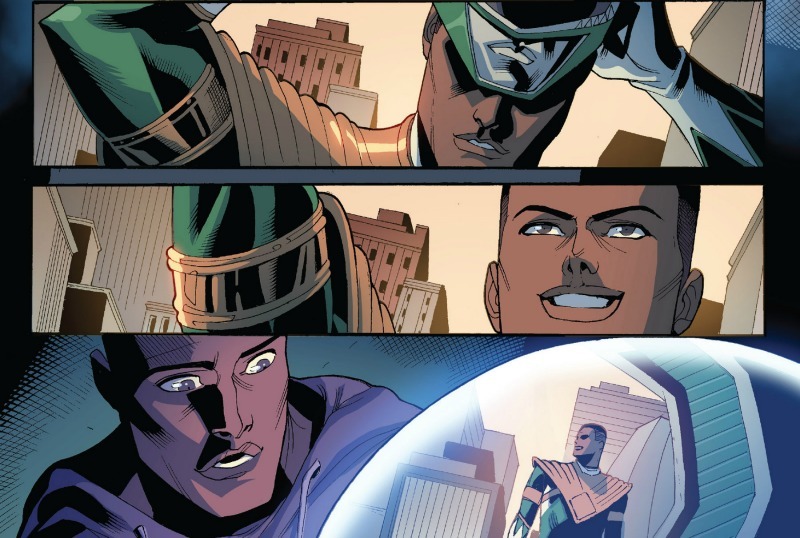 Mighty Morphin Power Rangers #5 tells us that before Tommy became Rita Repulsa’s evil Green Ranger, she made a play for Zack, the Black Ranger. After being “upstaged” by Jason during a fight, Goldar and the putties abduct Zack so Rita can make her pitch. Obviously, Zack doesn’t accept. But how do the events of this issue impact Zack’s relationship to the team? And what happens when Zack tells Zordon? Rita tempting one of the Rangers toward the dark side is such a simple, classic tale. It’s perfect for this series. I’m not sure I wouldn’t have gone with Billy instead of Zack, especially considering the scene we saw in issue #2. He was comparing himself to the others, and he seemed to become self conscious and bitter. If Rita could have seen that, she might have exploited it. On the other hand, we’ve seen some curious behavior from Zack in this series. He’s been very suspicious and apprehensive about Tommy. This issue seems to explain why. This experience gives him a negative connection to the Green Ranger that we never knew about. The Zack we’ve seen in this series isn’t the one I expected. On the show, Walter Jones played a fun-loving dancer. Zack is in love with life, and he’s not afraid to show it. That’s not the character we’ve seen in this series. For the most part he’s been very straight faced. I understand he’s in a very tense storyline. But flashes of personality aren’t going to hurt anything, are they? In essence, what we need in this book is a little more Walter Jones. Fussy Fanboy Moment: After Zack is abducted, he wakes up in Rita’s Dark Dimension, which we saw in the show. But in one of the “Green Candle” episodes, which these events obviously predate, Jason says he and Tommy are the only Rangers that have been there. On the plus side, Higgins sneaks in what seems to be a hint at Zack going to the Peace Conference later in the series. He tells Zordon, “I need to do more … I don’t care about leading. It’s not like that.” I like that second line. It speaks to why Rita’s plan for Zack doesn’t work. He’s imperfect like anyone else, but in the end he’s selfless. It’s more about the good that’s being done, as opposed to the glory you get from it. The opening sequence, set in Italy, is a lot of fun. The Rangers face Rita’s monstrous take on The Vitruvian Man, who can apparently only speak in da Vinci quotes. Afterward, they receive some fanfare on the ground. We even have the prime minister in the middle of the action. This is yet another example of Higgins doing something that never could have happened on the show. Thony Silas tags in on pencils for this issue. His style isn’t dramatically different from Hendry Prasetya’s, though his characters are slightly better at emoting. His Rita is particularly sinister. Again, his Zack seems very reserved and stoic, which is not the character we’re used to. “The Ongoing Adventures of Bulk & Skull” still doesn’t do much for me. Though we do get a surprise in this issue: The BOOM! Studios debut of Lieutenant Stone, Bulk & Skull’s foil from seasons 3 and 4. I’d always been under the impression they’d never met before. Either way, I’m glad to see the putty patroller story is over. On to (hopefully) better things. Higgins pleasantly surprised me with this Zack story, by following up on a plot seed he’d planted as far back as issue #1. It makes you wonder what else he might come back to in future issues. Whether it’s how Billy sees his role on the team, Jason feeling threatened by Tommy, or something else fans may have wondered about. There’s so much fertile ground to cover, and I’m hopeful that we’ve only scratched the surface. This entry was posted in Comic Books/Graphic Novels and tagged Billy Cranston, Black Ranger, BOOM! 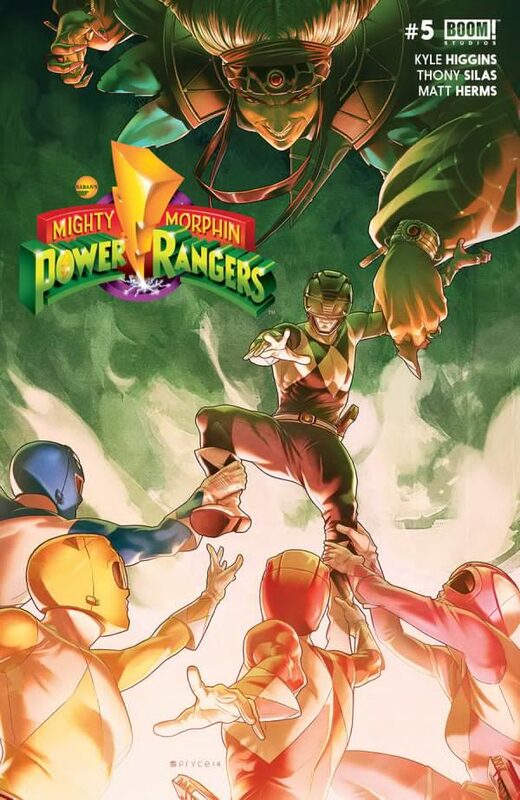 Studios, Bulk & Skull, comic book reviews, comic books, Corin Howell, Green Ranger, Jamal Campbell, Kyle Higgins, Leonardo da Vinci, Megazord, Mighty Morphin Power Rangers, Mighty Morphin Power Rangers #5 (2016), Mighty Morphin Power Rangers (BOOM! Studios), Pink Ranger, Power Rangers, Red Ranger, Rita Repulsa, Rob Siebert, single issue reviews, Steve Orlando, superhero comics, superheroes, The Vitruvian Man, Thony Silas, Tommy Oliver, Walter Emanuel Jones, Zack Taylor, Zordon on 07/21/2016 by primaryignition.